Phosphorous acid is soluble in water and alcohol. It can be slowly oxidized to phosphoric acid in the air. When heated to 180 °C, it can be decomposed into phosphoric acid and phosphine (highly toxic). As a dibasic acid, it has slightly stronger acidity than phosphoric acid. Its strong reducibility enable it to easily reduce Ag+ to metal silver and sulfuric acid to sulfur. . It is corrosive, deliquescent and fairly hygroscopic. Phosphorous acid is widely used as the raw materials to produce phosphorous acid salt and plastic stabilizer in the plastic industry, and as reducer in chemical reaction. 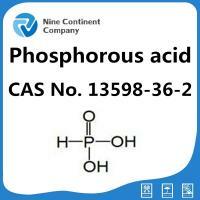 Phosphorous acid is also used in the synthetic fibre and pesticide industry etc. Phosphorous acid is mainly used as reducing agent, nylon whitening agent, the raw materials to produce plastic stabilizer in the plastic industry,and is used in the synthetic fibre industry. In pesticide industry, phosphorous acid is the main material for the manufacture of herbicide, bactericide and water stabilizer. Acidity. During operation, protected with safety goggles and acid-resistant gloves.Avoid contact with eyes and skin. In case of contact flush with water. 500kg/1000kg net in container bag, or 25kg net in paper-plastic composite bag.The caution of ‘’CORROSIVE” shall be marked on the surface of package. Belonging to secondary inorganic acidic corrosives, phosphorous acid should be covered and protected from the rain and moisture during transit. It’s strictly prohibited to transport the product together with alkali and oxidizing substances.